Lucky You: While we try to have bolt-in swaps for vehicles with factory projectors, having brackets for every fitment just isn't viable. Luckily for you, the Universal Morimoto Retro-Quik system is designed as a direct bolt-on upgrade for a big performance boost inside headlights of any vehicle with an existing projector. Bi-Xenon Projectors: Morimoto's most modern bi-xenon, the Mini H1 7.0, was an instant winner upon launch. Representing the first full overhaul of the Mini H1 since way back when the 1.0 came out, it's now one of the most advanced headlight projectors in the world today. Revised reflector optics paired with their curved cutoff shield produces one of the widest low beam patterns we've ever seen, and a high beam that will easily go the distance. Kuria Optic clear lenses maximize intensity throughout, and keep the cutoff line sharp, colorful, and attractive. New side-action solenoids are more than 3x stronger than the old and fussy vertically-sprung units. Result: Maximum light on the ground, zero glare to oncoming traffic. Mounting Hardware: 100% Engineered in the US. Laser cut from automotive-grade G10 fiberglass. The Retro-Quik brackets at the heart of the kit are designed to adapt the Morimoto Mini 7.0 Bi-xenon projectors directly in place of the unsophisticated stock units. Using the original mounting holes paired with new hardware, they are the beauty behind the kit that makes it an easy install. You're welcome. Optional HID Ballasts: Morimoto’s XB ballasts are a functional work of art. While the industrial-edge design by California native Artur Saakyan looks great from the outside, they’re packed with too much modern tech on the inside to cover it all in on place. Their DSP 3.0 circuit maximizes reliability, input and output efficiency. Their ability to warm the bulbs up to full operating intensity quickly is matched by few. Hardly are all aftermarket-HID ballasts the same, and the XB’s make that clear in most every category in our opinion. Optional H1 HID Bulbs: Homegrown by Morimoto to out-perform any alternatives on the market when installed in projector-based headlight…and it shows. We admit the latest generation XB HID bulbs are pretty impressive when compared to other bulbs, and even older Morimoto bulbs. At the heart of the XB bulbs is their perfectly-aligned 100% Philips quartz glass capsule that houses high quality halide salts from German-supplier Messer. In our annual lux comparison test, they produced nearly the same luminosity (intensity) as the industry benchmark Osram CBI bulbs at 5500K. No, you're not seeing things here, but yes you will be seeing everything at night. Optional Relay Harness: As one of the most important parts in any HID lighting upgrade, don't skimp out when it comes to your wiring. It doesn't matter how good your ballasts are or how good your bulbs are, if your harness is a piece of crap, when it gives out your headlights are gonzo. The Morimoto HD Relay harness is easily worth the premium price compared to cheaper alternatives. With triple-sealed twin relays, 14ga. stranded copper wiring, over-molded fittings, and plug-n-play functionality, it will ensure everything functions properly and permanently from the original in-cabin controls. It’s easily the best headlight wire harness out there. Optional High Beam Splitters: Double high beams?! whaaaat! 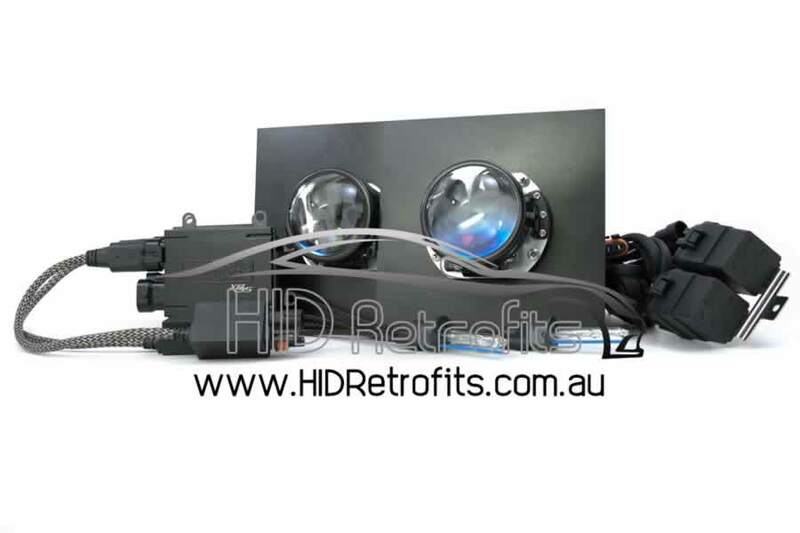 Put simply, the optional Morimoto high beam splitters allow you to make this feature work easily without any cutting or splicing to the factory wiring by diverting power from the halogen bulb into the projector’s high beam solenoid, making them both work at the same time. Optional Housing Sealant: Protection is priceless! When you're putting together a set of high-end headlights, the last thing you want is moisture in 'em the first time it rains outside. RetroRubber is the most effective way to make sure the original seal is fully restored. For the small price, why anybody wouldn’t prevent their new headlights from fogging up is beyond us. It’ll be the best few bucks you’ve ever spent.